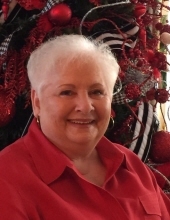 Mrs. Judy Lee Godwin, 75, of Dunn died Monday morning at her residence. She was born in Sampson County on March 20, 1943 to the late Percy and Elizabeth Lee. She was preceded in death by two brothers, Ray and Jimmy Lee, and a sister, Lib L. Britt. Judy owned and operated Judy’s Interiors for a number of years. A funeral service will be held Wednesday at 11 a.m. at Glad Tidings Church by Rev. C.H. Lee and Rev. Tim Rice. A private entombment will be held at a later date. She is survived by her husband, James Pat Godwin, Sr, of Dunn, a son, James Pat Godwin, Jr., and wife Minnie of Dunn, two daughters, Pam G. Faircloth and husband Junior, Phyllis G. Norris and husband Roy all of Dunn, a sister, Sue Lee Makey and husband Bob of Newton Grove, five grandchildren, Patrick Godwin and wife Danielle, Justin Godwin, Anna F. Winters and husband Brooks, Elizabeth Faircloth, and Blake P. Norris, five great grandchildren, Dane and Arleigh Godwin, Cameron Marshall, Chole Faircloth, and Kenlee Reese Winters. The family will receive friends Tuesday from 5 to 8 p.m. at Skinner & Smith Funeral Home. The family asks instead of flowers that memorials be made to Friends Fighting Cancer, P.O. Box 2265 Dunn, NC 28335. To send flowers or a remembrance gift to the family of Judy Lee Godwin, please visit our Tribute Store. "Email Address" would like to share the life celebration of Judy Lee Godwin. Click on the "link" to go to share a favorite memory or leave a condolence message for the family.